John Williams wrote two new film cues for Superman IV - themes for Nuclear Man and Lacey. Alexander Courage conducted and adapted the score. This is the first time Williams has returned to the Superman universe to compose new music since the first film. Superman IV featured the return of composer John Williams. While Alexander Courage was responsible for the film score, Williams wrote additional Superman cues for Nuclear Man and Lacey. 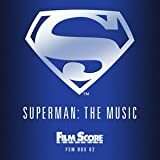 The Complete Score for Superman IV by Alexander Courage was finally released in 2008 as part of a Boxed Set also featuring the complete and remastered scores for Superman, Superman 2, and Superman 3 by John Williams and Ken Thorne. Also included on the Superman 4 discs are the complete and previously unreleased 80s pop music tracks by Paul Fishman (Member of 80s synthpop band "The Re-Flex") which are featured in the movie. Several of these pop tracks by Paul Fishman can be found in the movie such as the Gym Workout music, however, some of these songs did not make it in the movie's final cut, as they were featured in deleted scenes, in particular the Metro Dance scenes which heavily featured Paul Fishman's music.